ATTITUDE! 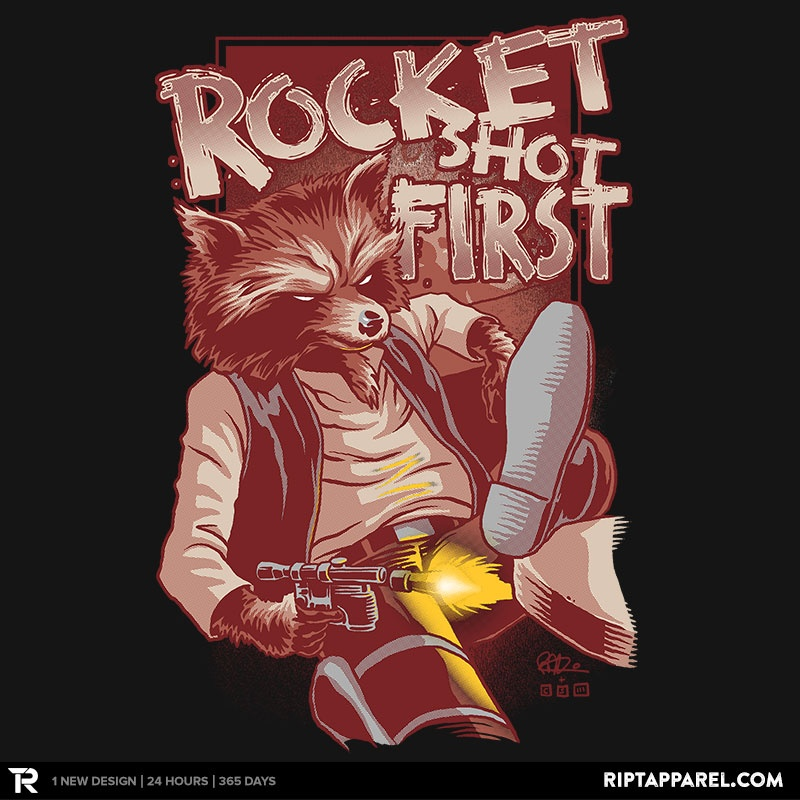 Both Han and Rocket are a shoot first ask questions later kind of guys. Rendered here in a tough, “cool guy” slouch, Rocket looks relaxed and nonchalant. Of course, hidden below this calm demeanor is his pistol pointed straight at its victim. I love his well illustrated raccoon face and his highly expressive eyes. The bold blocks and rough outlines of the letter forms justly fit the tough guy persona of both characters. I also really enjoy how the bright yellow of the fire really stands out against the earth tones of this design. And yes George Lucas, Han shot first! Surprise! I picked a Dr. Who shirt! Weird huh!? Tah dah, tah dah, tah dah, tah dah (that was my best onomatopoeia of the show’s intro music). I really enjoy this clever mash-up. 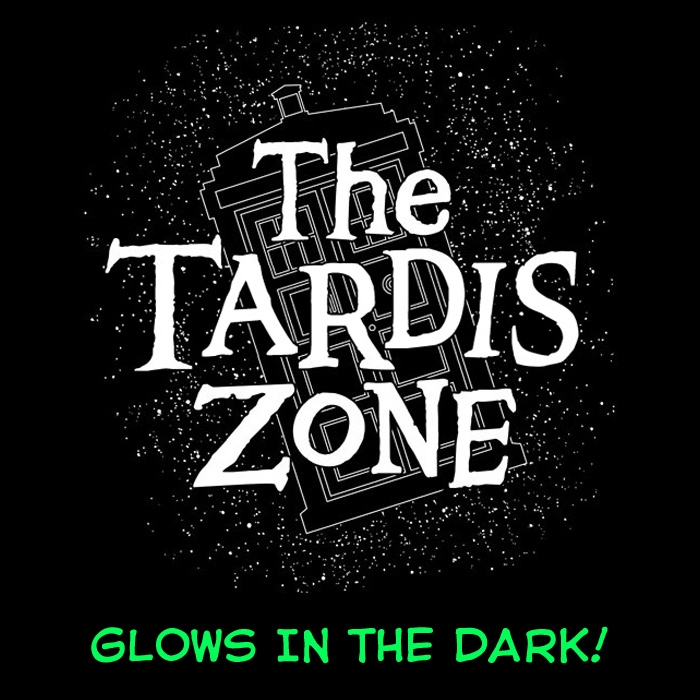 Exploring space and time, the Tardis could definitely be in an episode of the Twilight Zone. Nice, simple outline of the tardis floating through space. Wonderful translation of the letter forms including: the odd-shaped serifs, various baselines, x-heights, and shifting letter axis. As you guys know, I am a sucker for typography and black and white designs! 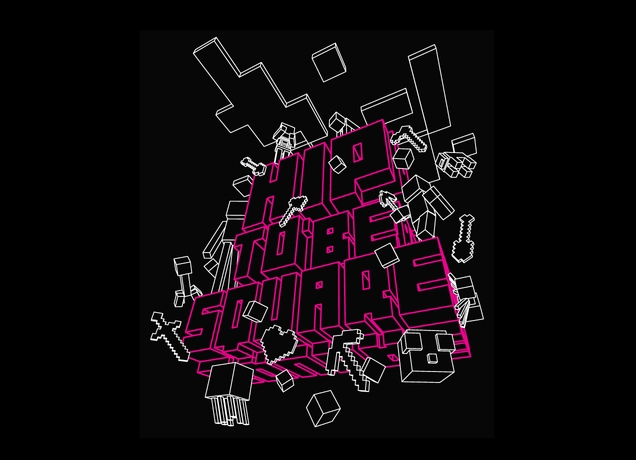 It is hip to be square, in a pixellated digital world! I love the angle in which this design is presented. It works great for the little 3-d objects and block letter forms. All the little objects seem to shift planes which make them appear in motion. Having the design be in simple black, white, and bright magenta definitely helps give it a digital appearance. Awesome ZEROBRIANT shirt available this week at Zebra Tees! Also Design By Humans is matching Zerobriant Designs Fan Page‘s royalties for the remainder of May to raise money for his surgery.